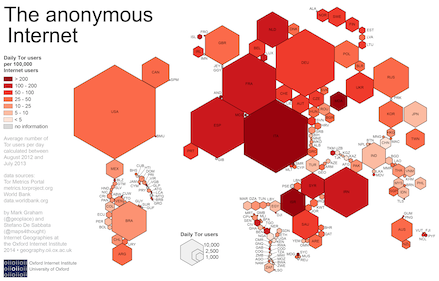 The Oxford Internet Institute made a cartogram visualization of Tor users as compared to the overall Internet population. They used the average number of Tor users per country from August 2012 to August 2013 and put it in relation to total Internet users per country. More details and conclusions can be found on the Information Geographies website at the Oxford Internet Institute.